All Borough and State roadways within the Borough are plowed and salted by Hatboro Borough. You can help in our efforts to clear the roads as quickly as possible by parking your car in a driveway or another (permitted) off-road location. And when shoveling your driveway, please remember to pile snow to the right of the driveway (if you are facing the street). In this way, the snow will be pushed away from the driveway entrance when the road is plowed. For questions concerning snow removal please call Borough Hall at 215-443-9100. During a snow storm, our Public Works Department works to clear streets and keep Borough roads safe and passable. The staff at Borough Hall can answer any questions or concerns you may have regarding snow removal, plowing information, and other information. Borough Ordinance requires all sidewalks to be cleared within twenty-four (24) hours after a snowfall. This is applied to all property owners, tenants and lessors. Also, please note it is unlawful to push snow into the street while clearing sidewalks, private walkways, and/or driveways. Only vehicles with chains, snow tires or all-purpose tires are permitted on roads that are covered with three or more inches of snow or in any instances in which a snow emergency is declared. Any vehicle that has stalled, is incapable of moving under its own power and/or is left unattended on any street during a snow storm will be removed or towed at the owner's expense. During a declared snow emergency, vehicles operating on any streets in the Borough must be equipped with snow rated tires or chains. Have you ever wondered what happens to the leaf bags and sticks you place curbside for collection? After our Public Works employees pick them up, the bags are transported to Abington Township's composting site where they are processed into mulch without added chemicals. Residents are welcome to stop by the bin at any time to take as much mulch as they need. The Public Works Department will make every effort to keep an adequate supply on hand at all times. Unfortunately, we are not able to load trucks with mulch at this time. Please note that mulch is available on a first come, first serve basis. Should you have any questions, please feel free to contact Borough Hall. 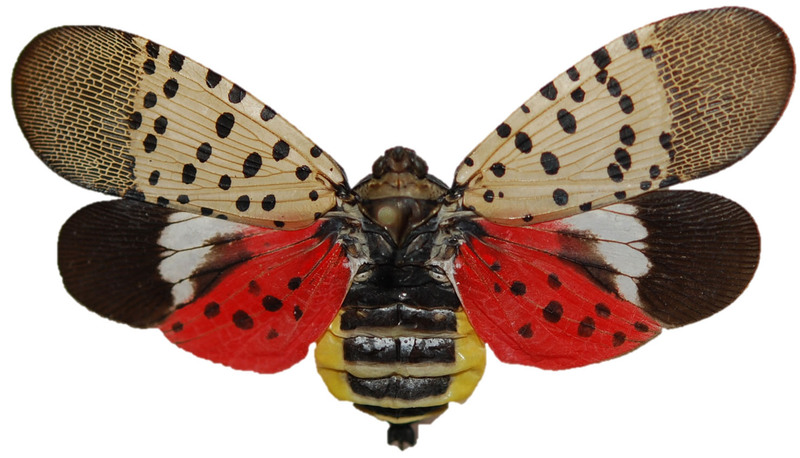 Montgomery County, Pennsylvania is currently under quarantine for the Spotted Lanternfly, an invasive species threatening multiple counties throughout the state. Spotted Lanternflies are planthoppers that attack host plants/trees, posing a threat to local vegetation and Pennsylvania's grape, fruit tree, and forest products industries. As a ressult, the Pennsylvania Department of Agriculture is asking residents in Pennsylvania to aid in the identification, collection, and removal of the invasive pest. HOW DO I IDENTIFY THE SPOTTED LANTERNFLY? HOW CAN I TELL IF A PLANT OR TREE IS AFFECTED? Once attacked by the Spotted Lanternfly, trees will develop wounds that weep and attract other insects. These wounds eventually leave a grayish or black trail along the trunk of the tree. Around the months of September and October, the Spotted Lanternfly lays egg masses on trees and smooth surfaces (such as stone, outdoor furniture, vehicles, etc.). These egg masses will have a gray mud-like appearance when newly laid. Over time, older egg masses will have a seed-like appearance and appear in rows of 30-50, measuring about an inch long. WHAT DO I DO IF I SEE THE SPOTTED LANTERNFLY? If you come in contact with egg masses, immediately scrape them off, double bag the masses and dispose of them in the trash. Egg masses can also be placed in alcohol or hand sanitizer to kill them before they hatch.